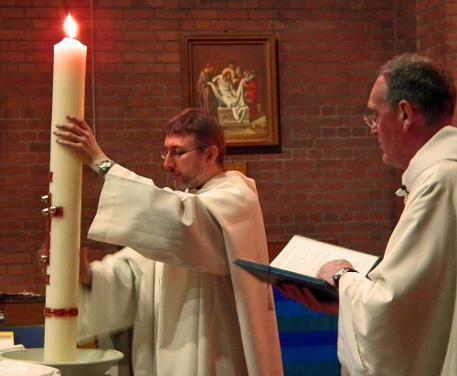 The origin of the paschal candle is uncertain. The most likely origin is that it derived from the Lucernarium, the evening office with which early Christians began the vigil for every Sunday and especially that of Easter. In the Lucernarium rite the light destined to dispel the darkness of night was offered to Christ as the splendour of the Father and indefectible light. This Sunday rite was logically carried out with greater solemnity during the Easter Vigil. Saints Ambrose and Augustine are also known to have composed such Easter proclamations. The poetic and solemn text of the " Exsultet," or Easter proclamation now in use, originated in the fifth century but its author is unknown. The use of the candle has varied over the centuries. Initially it was broken up after the Easter Vigil and its fragments given to the faithful. This was later transferred to the following Sunday; but from the 10th century the use prevailed of keeping it in a place of honour near the Gospel until the feast of the Ascension (now until Pentecost). From around the 12th century the custom began of inscribing the current year on the candle as well as the dates of the principal movable feasts. The candle hence grew in size so as to merit the attribution of pillar mentioned in the " Exsultet." There are cases of candles weighing about 300 pounds. The procession foreseen in the present rite requires much more moderate dimensions. 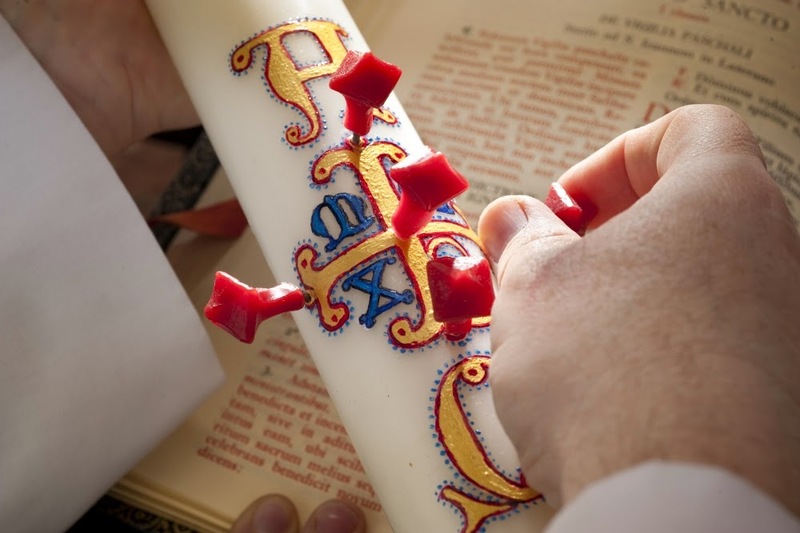 The paschal candle is usually blessed at the beginning of the Easter Vigil ceremonies and is placed on a special candlestick near the altar.